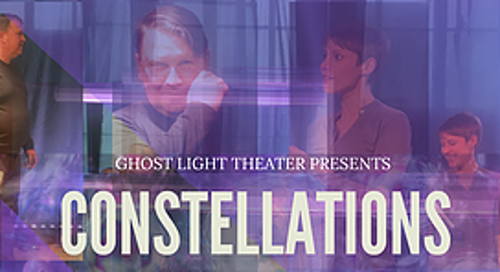 Nick Payne’s time- and mind-bending play Constellations receives its local premiere this month at Gateway City Arts, a production of Ghost Light Theater, the Valley’s five-year-old purveyor of contemporary plays that speak to universal themes. The piece has made its way here from its 2012 London debut via a Broadway run and a couple of previous outings in this region. This one, directed by Sue Dziura, stars Jen Campbell and Ghost Light’s founder, Kevin Tracy. As I said in my review of last year’s production at TheaterWorks in Hartford, the spell-binding two-hander looks at love and second chances through a prism of reflecting and refracting fun-house mirrors – or more accurately, through a spectrum of infinite chances. Marianne is a theoretical physicist, a cosmologist interested in the possibility that apparent conflicts within modern physics (specifically, the tension between quantum mechanics and general relativity) might be resolved by the idea of the multiverse. Roland is no theorist, but a humble beekeeper whose charges’ brief lives of honey-making are predetermined by instinct and genetics. Of the pair, Roland has the simpler storyline and more linear trajectory – just like his bees. Marianne is more complicated – volatile and ironic, her speech laced with sarcasm, casual obscenity and, progressively, with aphasic moments when a malignancy in her brain short-circuits her tongue. Constellations, which unfolds in a quick, crowded 80 minutes, is on the one hand a dizzyingly entertaining game, placing a simple love story within an intricate dramatic structure – boy-meets-girl-meets-boy-meets-girl-loses-boy-gets-girl-loses-girl, in an ever-twisting recursive loop. But it’s also a thoughtful meditation on the vagaries of chance, the fragility of connection and the transience of life in our corner of the cosmos. March 22-24 & 28-30, Gateway City Arts, Holyoke. Tickets $12 ($8 for Sunday matinee) here or at the door.